Two-color dater makes tracking incoming paperwork easy by stamping the word, PAID, in blue and the date in red. Below the date, the 1-1/4" x 1-3/4" impression also prompts you to write who received the documentation with the word, BY, and a line in blue. The dater is easy to use with a built-in, two-color stamp pad for date and message. Simply press and print. 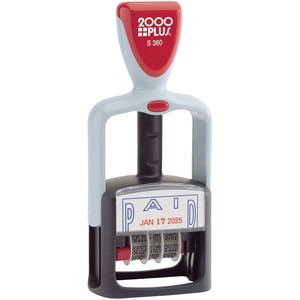 2000 Plus Two-Color Dater includes a six-year band and light-duty, ABS plastic mount. Cartridge-style ink pad delivers up to 5,000 impressions before re-inking. Dater is self-inking with water-based ink.